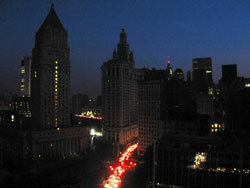 Downtown New York darkened by a power outage, Aug. 14, 2003 (Photo: Mandel Ngan/AFP-Getty Images). The scariest thing about the cascading power outages was not spoiled groceries in the fridge, or elevators getting stuck, or even, however cynical it may sound, sick patients left to their own devices without electricity-powered medical equipment. The scariest thing of all was chemical plants and refineries with 24-hour operations, which, if interrupted, can result in consequences even more disastrous and on a larger scale than those of an atomic bomb explosion. So it is safe to say that Americans got lucky this time. Several hours after the disaster, no one could know for certain whether the power outage was caused by an accident or someone’s evil design. In fact, the disaster on the East Coast illustrates just one thing: A modern city is in itself a bomb, regardless of whether someone sets off the detonator intentionally or by accident. As I recall, when I was writing my book Industrial Zone, in which business deals were bound to lead to a massive industrial catastrophe, at some point in time I was considering making a cascading power outage the cause of a catastrophe. Back then, I was amazed and shocked at the swiftness of the process. Shutting down at least one electric power plant is enough to cause a drop in power output throughout the entire power grid. This is followed by an automatic shutdown of nuclear power plants, a further catastrophic drop in power, and finally a cascading outage of the entire grid system. To start with, the electric power plant may burn out because of just about anything. In Ekibastuz [Kazakhstan] under the Soviet regime, a large hydroelectric power station was burned to the ground because of the negligence of one extremely smart worker, who used a wrench to unscrew the cap from a pressurized oil vessel. A stream of oil shot up to the ceiling; the worker got scared and dropped the wrench, which hit against the steel floor and created a spark that set the stream of oil on fire. Then the lights went off. Which brings us back to our main thesis. In order to destroy a modern city, one does not need to have nuclear weapons, because the modern city is in itself a weapon. The city infrastructure is an infrastructure with dual purpose. Why should terrorists need chemical weapons if their enemies already have chemical plants? Why should terrorists need nuclear weapons if their enemies already have skyscrapers and airplanes with tanks full of fuel, which can be hijacked with the help of a penknife? Why would they need sophisticated military technologies and stolen explosives if the KamAZ truck that blew up the hospital in Mozdok was carrying a load of, let us say, fertilizer? So-called dictatorship regimes and terrorists themselves have long since figured that out. That is exactly why there were no nuclear or bacteriological weapons in Iraq. Why not? A bomb planted on an airplane would kill dozens fewer people than a failure of the air traffic control system of a large airport. Sept. 11 taught the world that the infrastructure of the modern civilization could be as lethal as the weapons themselves. Last week, a significant and major addition was made to the lesson of Sept. 11: The actions of terrorists can’t always be distinguished from the actions of a drunken dispatcher or random lightning.